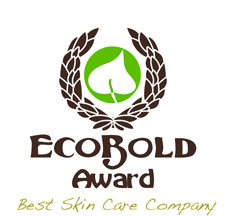 WoodSprite Organic Body Receives Best Skin Care Award from EcoBold! August 12, 2010--WoodSprite Organic Body was honored with the first annual Award for Best Skin Care Company by EcoBold (EcoBold.com), a leading provider of online video reviews of various green and eco-friendly products. "The contributions made by these green companies makes a tremendous difference in how people produce, consume, and think about the environment," said Steffany Boldrini, EcoBold CEO and Founder. "Their level of commitment and dedication to making a difference with sustainable and eco-friendly products are reflections of company-wide green initiatives towards a greener future." Companies were mainly judged by the greenness of their products compared to other contestants, and were furthermore judged on their Above and Beyond efforts in having company-wide green practices, on top of making a green product. August 17, 2009--WoodSprite Organic Body has been selected to be included in the Official 36th Annual Daytime Emmy Swag Bags! The awards will be held in Los Angeles, California on August 30th and broadcast on NBC. This year's bags offer a slightly different flavor from the typical gift bag, featuring products made by independent artists and small companies with something unique and special to offer. You can visit our Facebook page to see photos of the gift sets we made for the Swag Bags. January 16, 2007--WoodSprite Organic Soaps to be included in "green" gift bags at the Ultimate Green Room, held by Landers PR during the 2007 Sundance Film Festival in Park City, Utah. This "living lounge" will showcase eco-friendly, organic products and services in a relaxed, soothing environment for celebrities and VIPs from January 19-22, on Main St, in the heart of the festival. Featuring all organic fare from Chef Akasha, Silk Soy Milk's Chef, plus unique beauty products, natural spa services, and chic eco wearables, the focus of the event is to educate and inspire attendees with the benefits of green living in addition to garnering media attention for ecological issues. The event will also raise proceeds to benefit the non-profit organization, The Creative Coalition. 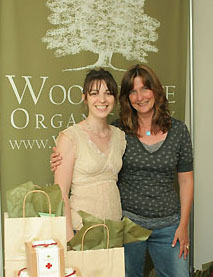 June 30, 2006--WoodSprite Organic Body has been invited to sponsor at the Kari Feinstein Style Lounge preceeding the 58th Annual Primetime Emmy Awards, held in August. WoodSprite will be representing its handmade organic spa and bodycare products as well as offering its organic spa treatments to celebrities, stylists and media professionals with the collaboration of partner spa, The Secret Garden (North Carolina). The event will be held in Beverly Hills and a portion of the proceeds will benefit The Creative Coalition, a non-profit, nonpartisan social and political advocacy organization of the entertainment industry. June 8, 2006--Discerning shoppers now have a new choice for quality organic skincare. WoodSprite Organic Body is launching its long-awaited organic skincare collection, "Bloom", a line formulated using certified organic rose hydrosol and rose essential oil, which is highly regarded in aromatherapy for its gentle and healing properties for the skin. 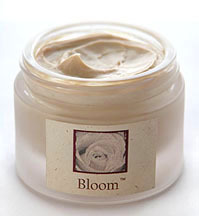 Bloom was designed for maturing or damaged skin, using regenerative botanical oils which are believed to assist the skin in healing itself, yielding a softer, more supple and healthy complexion. WoodSprite's aim is not to push "anti aging" products, instead emphasizing that healthy skin is beautiful skin, regardless of age. 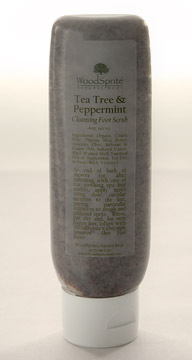 April 4, 2006--We're excited to announce that our Tea Tree & Peppermint Foot Scrub will be included in a specially commissioned Style Lounge Sampler at this year's MTV Movie Awards! The Sampler will feature handmade products from various independent artists and handcrafters, and will be handed out to celebrities, stylists, VIPs and media professionals who attend the event. To learn more about The Sampler, please visit their website.